The debris hut is an extremely versatile wilderness survival shelter. It can be built in almost any habitat and does not require tools or special equipment. 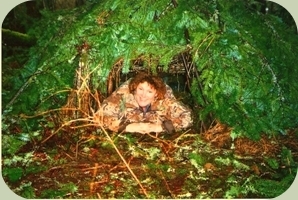 Creating an effective shelter is one of the most important priorities in a survival situation. Most lost persons perish from hypothermia, which may have been easily avoided had they constructed a simple shelter. 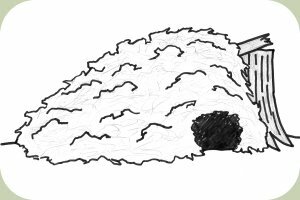 The debris shelter is constructed using sticks and any available debris, such as leaves, moss, ferns, bark, etc… The key to a good shelter is to insulate yourself from all of the forms of heat loss. Your body can lose heat through direct contact with the ground, wind, and simply radiating off of your body. Therefore, your shelter needs to provide insulation and protection from all of these elements. 1.) Select a location that provides ample building materials (sticks and debris) that is safe from falling branches, pooling water, and other hazards. 2.) Prop up a sturdy 8-foot pole-like branch on a stump or crook of a tree. This ridge pole should be sturdy enough to support your weight. 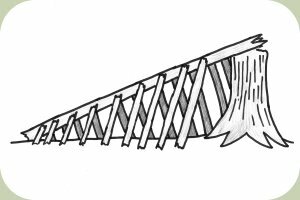 The size of the space underneath the ridge pole should be just large enough to fit your body plus six inches of debris on all sides. 3.) Lay shorter stick along the length of the ridge pole on both sides, leaving room for a doorway. These shorter sticks are called ribbing. The ribbing sticks should touch the ground roughly six inches outside of where your body would lay. 4.) Add smaller sticks on top of and perpendicular to the ribbing sticks. These latticework sticks will keep the outer debris from falling inside the shelter. 5.) Pile large amounts of leafy debris on top, as well as inside. Use your driest, softest debris on the inside closest to your body. When complete, there should be at least three feet of debris piled up on top and on all sides of the shelter. 6.) You can lay more sticks on top to keep the wind from blowing the debris away if it is a windy day. 7.) A door plug can be created by stuffing a shirt full of leaves. Crawl inside, being sure to burrow into the leaves, so that there is a mattress of leaves insulating you from the ground and on all sides. Though nothing like the warmth of your own bed, a debris hut will allow you to survive the night.